Dean Innes and his co-worker Bill Hume were invited to attend the Edmonton Oilers versus the Chicago Blackhawks hockey game as guests of Shawn Sloman, their NAPA auto parts supplier’s representative on November 21, 2016. Ready for all the excitement of the evening, little did Dean know that most of the action was going to happen off of the ice. Just prior to the puck drop, as they were getting ready to go to their assigned seats, Bill collapsed to the ground. Dean immediately leapt into his first responder mode. He felt for a radial and carotid pulse and detected a weak fluttering pulse like he had never felt before on a patient. Dean then instructed Shawn to activate EMS by calling 911 and also asked him to locate and retrieve an AED. Shawn immediately took these instructions to task as he understood the seriousness of the situation, given that in his previous career he was a first responder as well with a volunteer fire department. While waiting for the AED to arrive, Dean commenced CPR compressions on his co-worker. During this time, a Rogers Place emergency staff employee arrived at the scene with oxygen. Dean applied the oxygen and the two of them continued working on Bill using two-person CPR. As soon as Shawn returned with the AED it was quickly applied and two shocks were delivered to the patient. By the time several shocks and six minutes of CPR were administered, Bill regained consciousness. Edmonton EMS arrived and followed up with necessary drug intervention prior to transporting Bill to the nearest hospital. At the hospital, Bill underwent angioplasty surgery and received five stents. Bill is on his way to a full recovery after his ordeal. The hospital doctors made mention that the compressions that Dean delivered must have been very effective which played a vital role in saving his co-worker’s life. 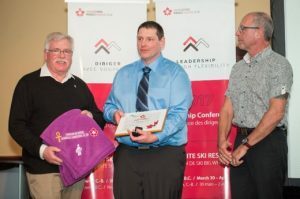 The CSP was pleased to present Dean Innes with a Lifesaving Award at the CSP Leadership Conference in April, 2017. This entry was posted in November 2017, Public. Bookmark the permalink.